Ventx is a major supplier of industrial vent silencers and inline industrial silencers. We offer a bespoke design service to ensure each silencer is manufactured to meet the customer’s specific requirements. Noise is a particularly difficult factor to predict. An advanced computer program is at the core of Ventx’s silencer design procedure. This specially created program allows us to see the noise level most likely to be created from the customer-provided data. However, it is not as simple as having a computer program. A proven noise-reduction solution is provided through the interpretation of data, combined with Ventx’s experience. Drawing on over 40 years of acoustic knowledge and 30 years of quality silencer manufacturing, a Ventx industrial silencer uses a combination of diffuser design and an absorptive core section. Our designs are guaranteed to meet the noise attenuation required and this guarantee extends to all workmanship. Atmospheric vent silencers are the essential component when venting steam, air, nitrogen or other gases, and are designed to reduce valve noise to whatever level the customer requires. There are two types of Ventx inline silencers: the first is for used with a control valve and offers pressure and noise reduction; the second type offers minimal pressure loss and is used on compressors’ inlets. Ventx also designs and supplies a cost-effective silencer solution that can be fitted inside customer pipe work or vessels, along with silencers for steam, gas and air ejectors. Ventx designs each industrial silencer to reduce the noise level to the required sound pressure level specified by the customer. Silencer design is constrained by the flow conditions and the overall performance required. Ventx’s industrial silencers have a basic design principle that enables us to supply the best solution for the customer. 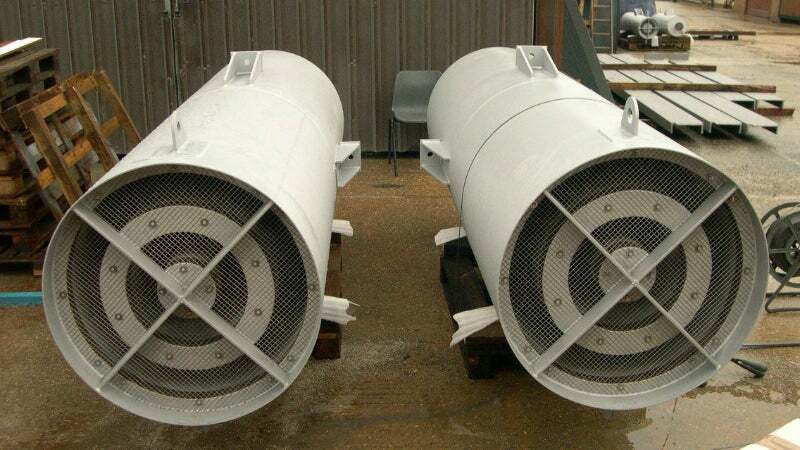 Atmospheric vent discharge silencers (VDS) from Ventx are manufactured using a combination of diffuser designs and an absorptive core section. The gas and noise enter the silencer through a multi-hole diffuser and then expand through many holes into the expansion chamber. These units can be designed to be mounted vertically or horizontally, and are available with optional bird screens and weather-hoods. The design of Vendx’s control valve silencers (CVS) employs the same principle of acoustic design as a vent silencer. This type of silencer is usually designed to a pressure code. If requested, Ventx can design to ASME B31.3, ASME VIII or PD5500. Direct in-line silencers from Ventx are designed to produce as little pressure loss as possible, but achieve the required attenuation using only an absorptive section. These units are often found on compressor inlets and outlets, and can be designed to a suitable pressure code. Direct in-line silencers can be supplied as a simple acoustic core for inserting into the customers pipe work or vessel. Ventx provides steam ejector silencers (SES) or gas ejector silencers (GES), which are specifically designed for use with steam or gas ejectors. Ventx calculates the ejector noise and flow mixture. As customer requirements vary, Ventx is always available to discuss any specific requirement. Ventx’s industrial silencers meet the relevant noise standards, including the Control of Noise at Work Regulations 2005 and Environmental Noise (England) Regulations 2007. Ventx serves the needs of the petrochemical and service industries to manufacture a solution for venting and noise in pipework. Our custom-built silencers provide a cost-effective and practical answer to our customers’ noise problems. Ventx’s customer service is one of the fundamentals of our business. Our customers’ requirements may vary as their projects evolve and we are always available to help with different silencing scenarios. It is vital that industry professionals keep noise levels to a minimum to ensure they comply with health and safety standards, but the right equipment is needed to do this. Ventx has more than a decade of industrial silencer design; it uses more than 40 years of acoustic knowledge and 30 years of quality manufacturing. Ventx offers high-quality industrial silencers to keep power facility noise levels to a minimum. Custom intake silencers help to minimise noise levels in many industrial environments. When the situation calls for industrial silencers, people come straight to us. Our expert team is capable of creating designs for all kinds of situations. Noisy environments are part of many power industry professions and the longer you’re exposed to loud sounds the more likely it is that you’ll suffer negative effects such as hearing damage. Ventx offers several measures to reduce the different types of pollution that occur in heavy industries. Industrial settings often have extremely loud noises, which need special measures to prevent serious issues. Ventx has more than a decade’s experience in natural gas silencer engineering. The company also develop a host of other industrial models for various needs. Ventx is one of the country’s top suppliers of bespoke silencers for HVAC systems. Ventx provides industrial silencers for many companies across the world. All employers should ensure employees are safe in the workplace. An industrial silencer is useful in many types of power applications. Using first-class merchandise, Ventx helps customers to create a quieter and safer workplace, and if you are currently searching for a reliable silencer solution, you’ve come to the right place. Ventx Limited has sent more large steam vent silencers to Stanlow Refinery at Ellesmere Port, Cheshire, UK. Vent silencers are always one of the items ordered on most large projects. With many projects re-starting after global economic slow-down it will still be a few months before customers start to look at ordering new silencers.